Dream Tree Challenge – The Pine-ata! It just wouldn’t be Christmas without a frolicsome pun from the Prudent Baby ladies and so we present our Michaels Stores Dream Tree Challenge contestant, The Pine-ata! Last week we showed you how to turn a simple tiny gift box into a beautiful DIY tissue fringed ornament, then we filled an entire festive tree with a variety of shapes covered in pretty tissue fringe. We added tassels, pom poms, confetti garland and a fringed handmade tree topper. Then when our tree was sufficiently adorned, we stitched up a quick fringe felt tree skirt to match. 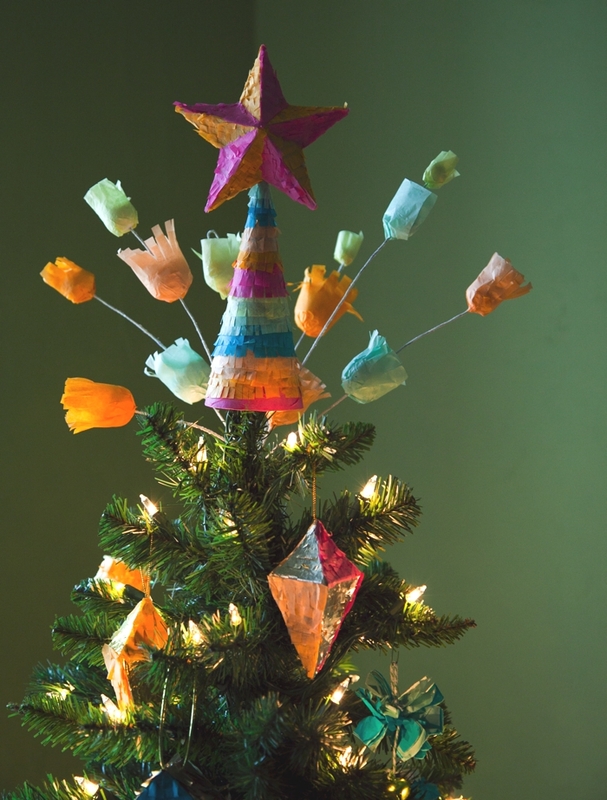 We love that our tree brings together the strong Mexican cultures in our home states of Texas and California and think it’s fantastic that you can decorate a beautiful colorful tree with just a few inexpensive supplies from Michaels. Want to see all of of gorgeous trees from some amazing bloggers? Here’s the Michaels Facebook Album of all of the Dream Trees. Here is a Pinterest board of all of the trees as well! Michaels supplied this easy to assemble pre-lit 6′ tree and a gift card to cover decorations. Nice pics & great idea! Love this! How fun for.the kids it’s loke a present tree!!! 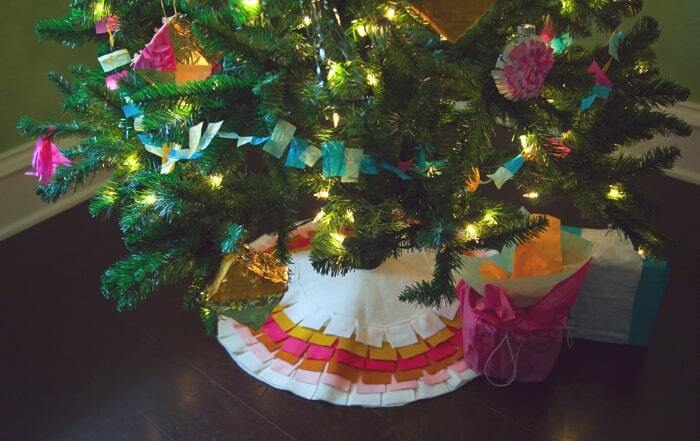 that tree skirt is GENIUS you should throw yourself a fiesta over it. I’m totally making one. but did you use acrylic felt?! that’s the only thing I fear, so pricy in 100% wool…but acrylic won’t hold up! I have this dilemma every year. Great Idea. Its nice and simple but beautiful. I love the tree skirt! 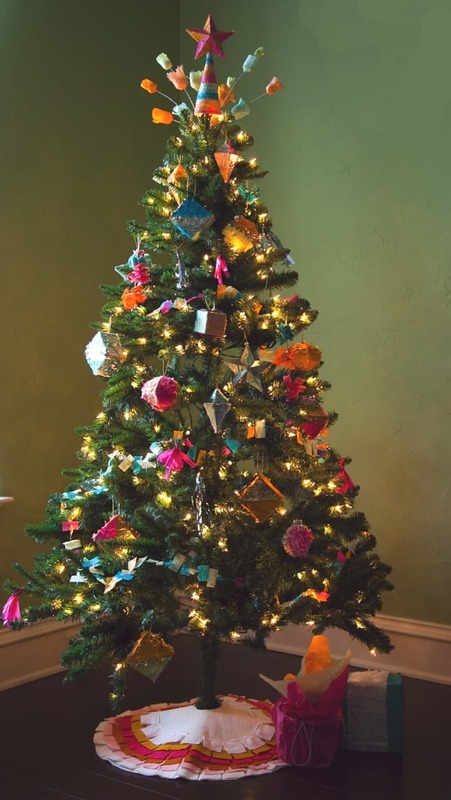 I need one for my real tree..any chance there might be a tutorial coming up with that? or is there one already?? Hey ladies. I wasn’t going to bother with a tute because it was so simple but I should because I LOVE how it came out. I used acrylic felt from Micheals. I haven’t seen any tree like this one. Creative and original. Nice work!